All right best man, time to remind your friend why he chose you to stand beside him. Being a best man is a great honour and comes with huge responsibility – your focus is the groom and giving him the best time possible. The most important night, besides his wedding day, is his bachelor party. Now, you don’t want to go bowling or simply hangout at a bar, or do an escape room, you guys want to have an unforgettable and awesome experience. If you’re looking for the ultimate Ottawa bachelor party idea, look no further, Bad Axe Throwing is your answer. It’s fun, exciting & the “manliest” thing you could possibly do in Ottawa, let alone Canada. It’s 2.5-3 hours of axe throwing fun where you can bring your own food and drinks! Axe throwing is a great way to celebrate the groom while having fun with the guys. Fresh lumber, steel blade axes, and your favourite crew will make this bachelor party an experience to remember. 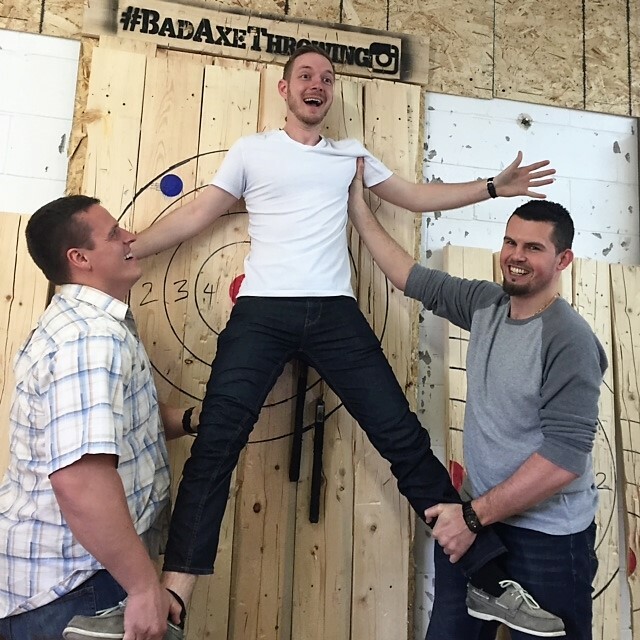 A bachelor party at Bad Axe Throwing Ottawa is an excellent choice to step out of the ordinary and have an action packed time. 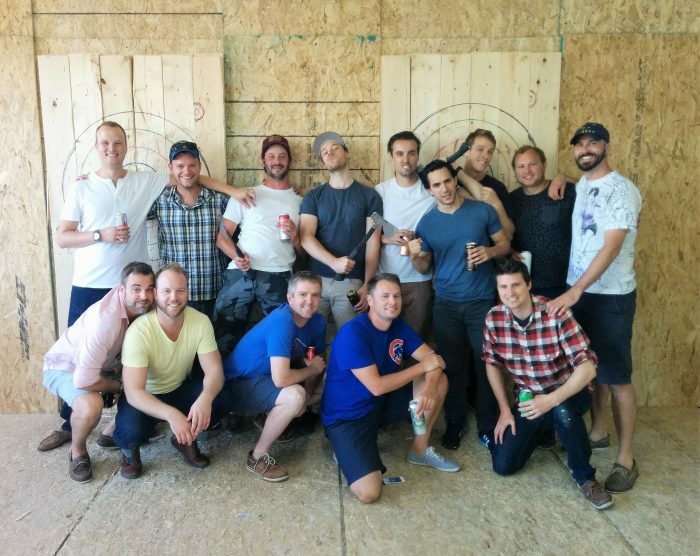 The urban sport of axe throwing has become a popular destination for bachelor parties. It’s a twist from the typical dudes night and creates a fun atmosphere of games, competition, and of course – heckling the groom. If you’re looking for the perfect bachelor party idea in Ottawa, Bad Axe Throwing is your answer. Bad Axe Throwing has flourished over the past few years with 10 locations popping up all over Canada and one in Chicago. People everywhere are enjoying the thrill of releasing an axe and the anticipation of hearing that loud thud when it hits the target. What’s great about the sport is you don’t need to be a professional to enjoy it, you just need to want to have fun. The experience and our coaches are what make us the go-to destination for bachelor parties. A Bad Axe Throwing bachelor party is a great place to sharpen your skills, impress your friends and just have a good time. It is an excellent way to bring the guys together. For your event, you will get a private lane or lanes (depending on how big your party is) and an axe throwing coach. They will start off by teaching you the technique of how to throw an axe. Then we’ll start things off by having some fun team games, splitting the guys up and creating that great/fun competition among friends. Afterwards, you will all take part in an axe throwing tournament to determine who will be the axe throwing champion. Did we mention that food and drinks are allowed in our venues with no additional costs? So, before he says, “I do” to his lovely bride, he’ll be saying, “thank you” to you for throwing him a bachelor party at Bad Axe Throwing. Contact us today and save the date, we’ll book you in and make sure your time is unforgettable.